From small gathering of local bloggers to unexpected nationwide popularity: well, that is the BlogFest SOCCSKSARGEN. Hundred bloggers from different parts of the region will merge in the Tuna Capital with a common advocacy of projecting South Central Mindanao in a more positive light through blogging. LiveinthePhilippines.com's Bob Martin (popularly known as MindanaoBob in cyberspace) is a foreign blogger who loves the county so much, Mindanao in particular. He is responsible for blogging positive lights about Mindanao despite of not-so-good news (terrorism, kidnapping, etc) from print media, television news and internet. Hon. Darlene Antonino Magnolia-Custodio, or known as the prettiest politician (and I like that tagline!) was was a former representative of the first district of South Cotabato and the current mayor of General Santos City. She is responsible for launching the official websites of the city’s 69 public elementary schools and 26 barangay high schools through her administrations SHEEP-Computer Literacy Program, making GenSan the first in the country to have done so. Raffy Tima, is a notable TV News Anchor, Producer and Host of GMA Network and its affiliate GMA News TV. He was one of GMA’s main reporter during the 2000 to 2004 series of kidnapping by the Abu Sayyaf group and the all-out war of the Armed Forces of the Philippines against the Moro Islamic Liberation Front. Tima has also covered the war in Afghanistan in 2001 and Iraq in 2004. He also covered US President Barack Obama’s inauguration for GMA News. Abe Olandres is known in the blogosphere as Yugatech. (This guy is superb!) He is a tech blogger whose site, Yugatech.com is the country’s #1 review resource for electronic gadgets and IT-related stuffs. Mae Paner, popularly known as Juana Change (I'm craving to meet her personally for 2nd time around), is one of the Philippine Web’s biggest personalities. She portrays different characters to show Filipinos about the relevant issues in Philippine politics and government. Manuel Quezon III, more popularly known as Manolo Quezon, is a essayist and blogger. He is currently an Undersecretary of the Presidential Communications Development and Strategic Planning Office (PCDSPO). Prior to being appointed to the undersecretary position, he served as host of The Explainer and The Explainer Dialogues on the ANC cable news channel. He also headed the Speaker’s Bureau, columnist, and editorial writer for The Philippine Daily Inquirer and was the Assistant Managing Editor and an editorial writer for The Philippines Free Press weekly news magazine. 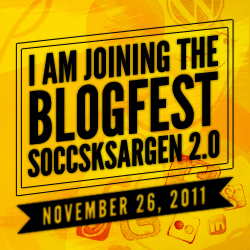 I can't wait to attend the grandest blogging event of the year, the BlogFest SOCCSKSARGEN 2.0 on November 26, 2011 at Sun City Complex, General Santos. This blogging event is sponsored by Smart Telecommunications Philippines, Dole Philippines, Inc., Circle of Arts Productions, Sagittarius Mines, Inc., organized by Project O! Consultants and is spearheaded by the Soccsksargen Bloggers. Its lead convenors are GenSan News Online Mag by Mr. Avel Manansala and GandaEverSoMuch.com of Mr. Orman Manansala.